Tuscany or Toscana in Italian, is a region in central Italy that extends from the Tyrrhenian Sea to the Apuan alps. It has a population of over 3.8 million people spread across 10 provinces with the regional capital being Florence. The region is renowned the world over for its rich history, incredible landscapes and culinary delights. It is also regarded as the birthplace of the renaissance and the region boasts a total of 7 world heritage sites! These among other reasons attract millions of tourists to the region every year and in 2012 Florence became the 89th most visited city in the world with 1.8 million annual visits. The history of Tuscan cuisine dates back to the Etruscan people, evolving through the centuries to the present day. It is thought that the renaissance played a major role shaping the future of modern cuisine. Chefs working for noble courts were required to prepare elaborate dishes that could impress other dignitaries. However not all Tuscan cuisine has such royal roots, in fact it is quite the opposite. When one thinks of Tuscan food simplicity should come to mind. Most Tuscan food has peasant origins from the Etruscan People to the Romans, who both happened to be lovers of wine and good food – just like our customers!. Their food was simple but quite varied. Legumes, bread, cheese, vegetables, mushrooms and fresh fruit were all commonly eaten. The region is also well-known for its rich game, especially wild boars, hares, fallow deers, roe deers and pheasant which all feature heavily in local cuisine. 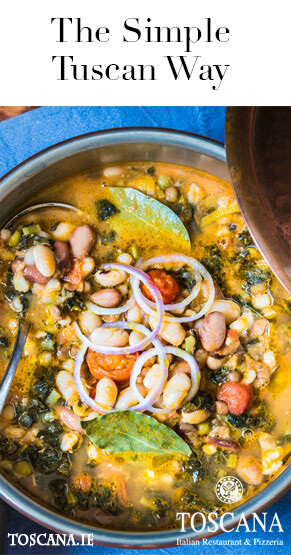 One such dish is ribollita, a famous Tuscan soup that has simple origins, the soup was originally made by reheating leftover minestrone soup from the previous day. Sources date its origins back to the Middle Ages when servants would gather up food soaked bread from feudal lords’ banquets. This may seem a long way from the present day dishes of Tuscany like ravioli, taglietti and gnocchi, but the Tuscan idea is still the same keep it simple with good quality ingredients. This is the idea we bring to each dish we serve in our Italian restaurant. We’re aware of the historic and rustic roots of Tuscan cuisine and try to do it’s heritage justice with each dish we serve! You can be the judge though and book a table here to see how our fare compares to ribollita!